Is Spain going to be the last test case for social democracy in the EU? Pedro Sanchez, Prime Minister of Spain talking to the press after an informal migration summit at the EU Commission in Brussels, Belgium on June 24, 2018. NurPhoto/Press Association. All rights reserved. European social democratic parties of the most populated EU countries have been trudging through stagnant water for the last ten years and will certainly keep struggling in the next decades too, unless a game change occurs. 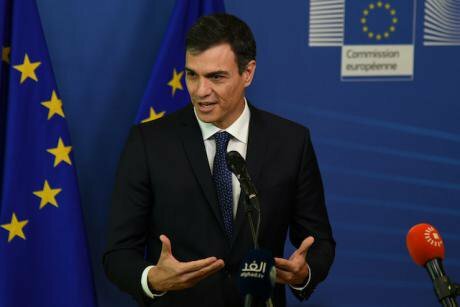 That game changer could go by the name of Pedro Sanchez, currently Spain’s prime minister, and his attempt to revolutionize Spain’s approach towards migration. But now things are about to change. Recently, Spain’s new Prime Minister pledged, during an Onda Cero radio broadcast, that his government is willing to remove the razor wire fences from both Ceuta and Melilla, thus sensibly shifting the political approach of Madrid towards the migration phenomenon. This could be a turning point for Sanchez’s Party, the PSOE, and ultimately for the future of social democracy in the European Union. However, the impact could go either way. According to the political scientist Ernst Hillebrand, alongside with terrorism and the economic crisis, migration is one of the main political issues of the second millennium and the stumbling block against which the flimsy waves of European centre-left parties have crashed themselves during recent electoral campaigns. The inability of traditional centre-left forces to address the migration issue and offer an alternative proposal to the far-right narrative on this trend topic has been the iceberg that has led to the sinking of left-wing and moderate left vessels all across the EU. Two vivid examples of this powerlessness are the trajectories of both the Italian Democratic Party and the French Socialist Party during the most recent elections (2018 in Italy, 2017 in France). The former obtained a dispiriting result (18.8% of the votes), losing almost 8% from previous elections and 185 seats at the Chambers of Deputies, while the latter had even a worse nightmare totalling 7.44% of the votes at the legislative elections and 6.36% at the presidential ones, moving from the 10 million votes obtained by Francois Hollande in 2012 to the 2 million votes of Benoît Hamon in 2017. Both parties were bearing the brunt of the outgoing government, but paid even a higher price due to their incapacity to structurally address the migration phenomenon in a more concrete fashion, thus losing votes in favour of the far-right and/or populist forces. Compared to these two parties, the PSOE and Pedro Sanchez have a major advantage: they know where the iceberg is and what it is made of. Nonetheless they will still need to identify the proper route to circumnavigate it with little or no damage, if they wish to bring the ship safely back to harbour (possibly for another glorious journey). Metaphors aside, this means that Pedro el Guapo and his socialist crew will have to find an alternative proposal to solving the issue which must go beyond the leftist “everybody is welcome” and, at the same time, must reject the usual far-right storytelling. A proposal that calls at the same time for burden sharing, EU solidarity mechanisms and refugees quotas on a mandatory (not voluntary) basis, as well as long-term solutions, flows control, development aid and EU political efforts towards the stability of both the Mediterranean and the Sub-Saharan regions. All in all, the future of the EU social democratic parties very likely depends on how the PSOE will address the migration issue and on the cascade effect it could possibly trigger. In the next European elections, scheduled for May 2019, the Spanish Socialist Party will only aspire to the 59 Spanish seats at the European Parliament. Nonetheless, should they be able to find by that time an innovative compromise proposal on migration, the other European centre-left forces might well replicate the inspiring PSOE model and benefit from an encouraging spill-over effect, thus reversing the negative trend they have experienced so far. Should the Spanish socialists fail at finding such a compromise, they will gradually disappear from the political map, as it is happening to other socialist and centre-left parties, thus wasting the very last chance of survival for social democracy in the EU. Suerte Pedro, you are going to need it.